When one of my favorite brands drops a new product, I'm all ears. I started hearing some hype building around the Milk Makeup Blur Stick a couple weeks ago, and it really sounded like something I'd want to try. It promises to blur imperfections on all skintones, from pores to fine lines, all while being oil- and silicone-free. Usually I stay away from blurring primers because they break me out in painful cystic acne - I'm pretty sure it's from the silicones. Anytime anything has that slippy texture, I run the other way. Hearing that this could somehow blur the skin without silicone really piqued my interest. The Blur Stick comes in Milk's typical "chubby stick" packaging, similar to their bronzer and highlighter. This makes it super easy to apply to the skin on areas of interest. It's the most interesting sensation to apply this to the skin - in fact, it feels like nothing. It doesn't leave the skin feeling slick or overly matte. I instantly can see a difference - my pores are smoothed over, and some discoloration seems to somehow be soothed (even though the product is totally clear). Dabbing a bit under my eyes even smoothes over some fine lines I've been noticing there. In the photos below you might be able to see the difference in texture it made around my nose. The photos are totally unedited (so enjoy my mustache and spotty chin). 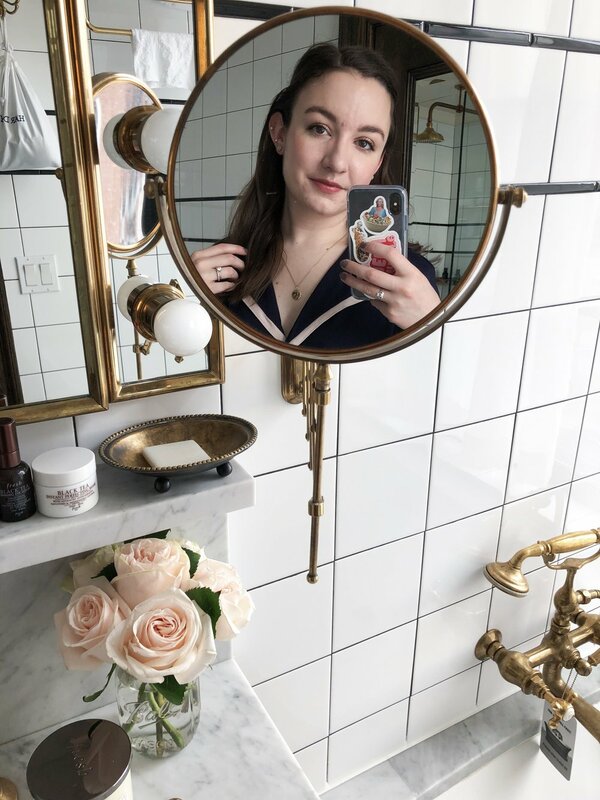 The Blur Stick claims to be mattifying, which worried me a little, as my skin is normally on the dehydrated side and I'm all about keeping things glowy. But I've found that since I only use it through the center of my face, it keeps those areas from getting greasy throughout the day. It doesn't dry my skin out - it just leaves it looking like skin. My makeup sits really well over it, too, although I have to make sure to only apply a small layer to my nose to avoid foundation breaking up on top. I haven't had any issues with breakouts or clogged pores after using it every day for the past week and a half. I bought my Blur Stick myself, but last week I got a super exciting package from Milk Makeup's PR Team containing three more - I gave them to my mom and sister to try, and since they have different skin types than I do, I thought it would be helpful to share how they're getting on with it, too. My sister is 21, and her main concerns with her skin are oiliness and her pores. She says, "I'd say that primers for oily skin make my skin feel tight and heavy, but this one just feels like my skin is naturally that smooth. It also doesn't feel like my pores are being clogged, which is what freaks me out about most primers. It's not the most oil-absorbing primer I've ever used but it does its job really well and feels so great that as of right now, it might be my favorite." My mom has asked me for recommendations a few times for oiliness and uneven skin texture, and she's really been loving the Blur Stick as well. She says, "I love how it feels when you put it on - almost velvety and so smooth. I put it on my entire face and it stays matte for the whole day, but it doesn't feel like there is even anything on my skin. I really like that although there is no color, it really does even out my skin. It even diminishes a broken capillary I have on my cheek! I will definitely use this every day regardless of whether or not I wear any other makeup because I feel like my skin looks so much clearer and younger." So it seems like Milk Makeup's Blur Stick will work well on a variety of skintypes as well as skintones as again, it is completely colorless. I'm in love with mine, and I'm super glad my mom and sister have been loving theirs, too. Have you tried the Blur Stick yet?